This Green Bay Packers mini helmet has been signed by the Pro Football Hall of Famer Paul Hornung. Hornung, a Notre Dame product, won the Heisman Trophy in 1956 and was drafted first overall in 1957 by the Packers. Hornung played nine seasons for the Packers, winning four NFL championships and a Super Bowl title. 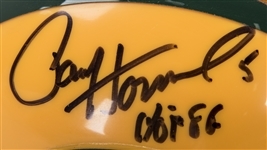 Hornung has signed this helmet in black marker, inscribing “HOF 86” below his signature. 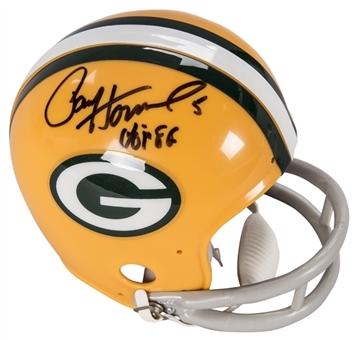 This mini helmet comes with a COA from JSA (AA82251).